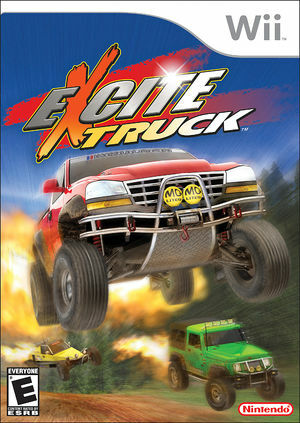 Excite Truck is a video game published by Nintendo and developed by Monster Games for the Wii video game system. It features malleable environments and tilt-based controls. The game was one of the Wii launch titles in North America. It is a spiritual successor to the Excitebike series (Excitebike and Excitebike 64). Excitebike was released on the Virtual Console service in Europe on February 16, to mark the European release of Excite Truck. Excite Truck is the first Wii game to let people select music, in the form of MP3s from an SD card, to be played in the background while they are playing instead of the music provided by the game. This feature is also used by Endless Ocean. Dolphin runs Excite Truck at speeds as high as 180FPS, yet shows a low vps. The game is very difficulty to play in this situation and there is no known solution at this time. See issue 6209. The main menu background video may appear corrupted, or may be distorted. Checking Fast Mipmaps and then unchecking clears the image up just fine. Fixed with 5.0-5745. The graph below charts the compatibility with Excite Truck since Dolphin's 2.0 release, listing revisions only where a compatibility change occurred. This page was last edited on 18 December 2017, at 02:55.